Vixen Optics VC200L 7.9"/200mm Catadioptric Telescope Optical Tube Assembly w/o Acc. Home > Telescopes > Cassegrains > Vixen Cassegrains > Vixen Optics VC200L 7.9"/200mm Catadioptric Telescope Optical Tube Assembly w/o Acc. 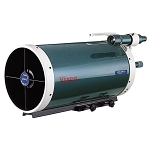 Vixen Optics' VC200L Telescope is neither a Schmidt-Cassegrain nor a Maksutov-Cassegrain, but instead a unique creation all its own: a catadioptric VISAC (Vixen Sixth-Order Aspheric Cassegrain) optical system, amongst the most sophisticated optical designs on today's market. This scope is free of coma, field curvature, spherical aberration, and chromatic aberration. Especially noteworthy is its edge sharpness and flatness, far exceeding 8" Schmidt-Cassegrain systems. It provides pinpoint (<15 microns) star images, even at the edges of its 42mm image circle. If you're looking for a photographic catadioptric tube, this is the choice. 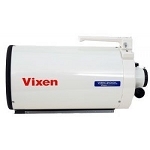 The Vixen VISAC optical system consists of a concave primary mirror, convex secondary mirror, and 3-element field corrector next to the focuser. 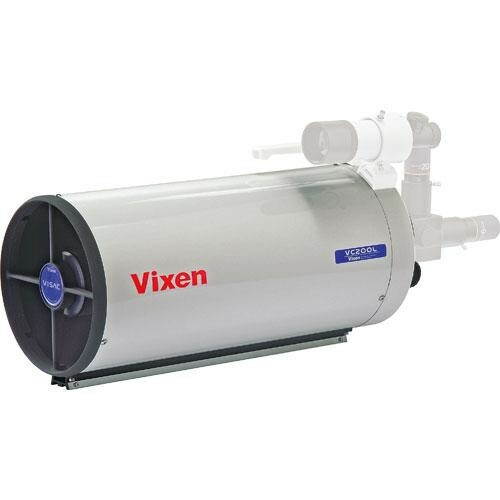 The VC200L's open tube design eliminates the typical chunk of glass up front, lowering weight and minimizing dewing problems. It broad 60mm focuser barrel and elevated optics give uniform brightness, aiding auto guide cameras & off-axis guiders. Because its rack-and-pinion focusing system's outside the scope, instead of upon the primary mirror, focusing the VC200L doesn't mess with the illumination or view. For a viewing catadioptric, it combines large aperture with fast focal ratio, making it well suited to our solar system and deep sky observing. This version of the VC200L does include the dovetail rail, but no other accessories. It is immediately ready to be mounted upon Vixen's equatorial mounts, Celestron's CG-5 and CGEM equatorial mounts, and Meade's LXD75 mount. Note: No accessories are included.